The contrast between China and Mongolia could not be more marked- more than a billion people in the former, just over 3 million in the latter. Dozens of megalopoles in the Middle Kingdom, only Ulaanbaatar as major center in its neighbor to the north. After all the city impressions during our stay in China, we were much looking forward to the stunning nature and emptiness that Mongolia promises. And we were not disappointed! We reached the country by taking a bus to the border in China’s Inner Mongolia, then crossed in a jeep, and finally hopped on a train to Ulaanbaatar, which goes the same route as the famous Trans-Mongolian Railway, straight through the Gobi desert. The landscape around here is unbelievably flat, no hill, no tree or bush as wide as the eye can see. National Museum of Mongolia provides a very interesting overview of the country’s history, culture and traditions (including, of course, Ghengis Khan, as well as a nice display of traditional dress). 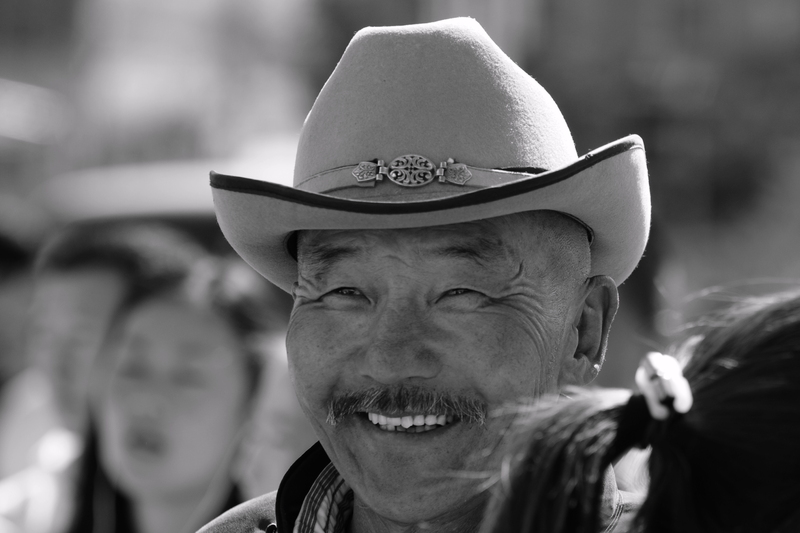 Mongolia has had a turbulent history with many occupations and only became properly independent after the fall of the USSR in 1990, when the socialist republic was turned into a democratic state. It is a country of extremes. 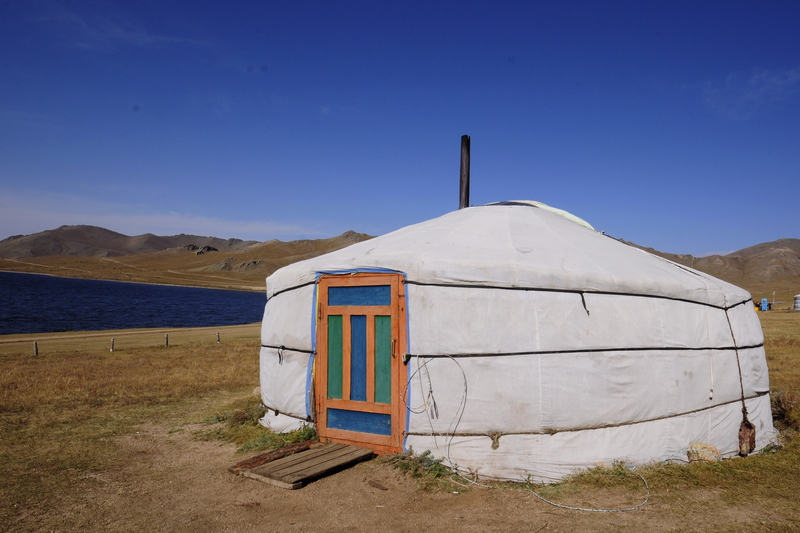 Ulaanbaatar is catching up with the West, and firmly focused on progress and modernity, while in the countryside, people still live a nomadic lifestyle, call gers (tents) their home rather than houses and learn to ride a horse from earliest childhood on. 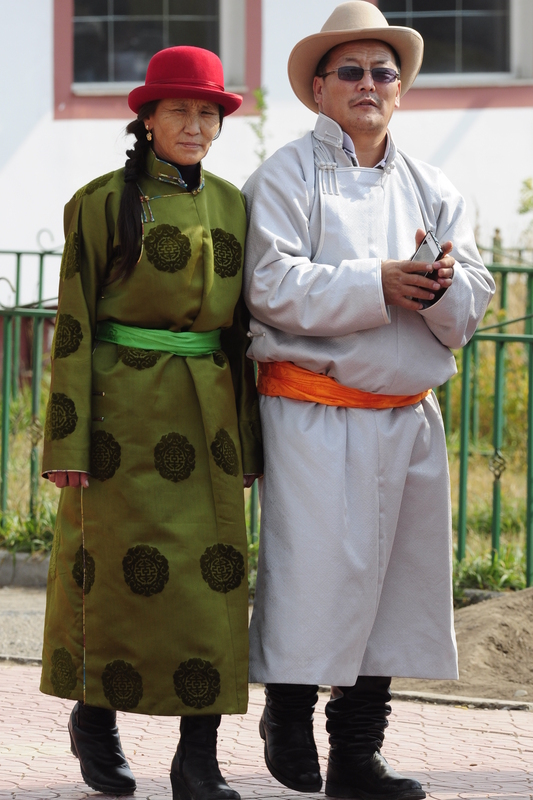 But even in the city, people maintain a link to their past, traditional dress is still worn on special occasions (such as weddings) or by older people in everyday life. We were eager to see more of this huge country, but public transport is few and far between, roads are often nonexistent (only a small percentage of them are actually paved) and jeeps with drivers are too expensive for our moderate budget. This is when we met Tom. An adventurous Hungarian with a very positive attitude, who decided to drive all the way to Mongolia and back to Budapest in his 1968 Opel Rekord (yeah, German car engineering, there you go 😉 ). 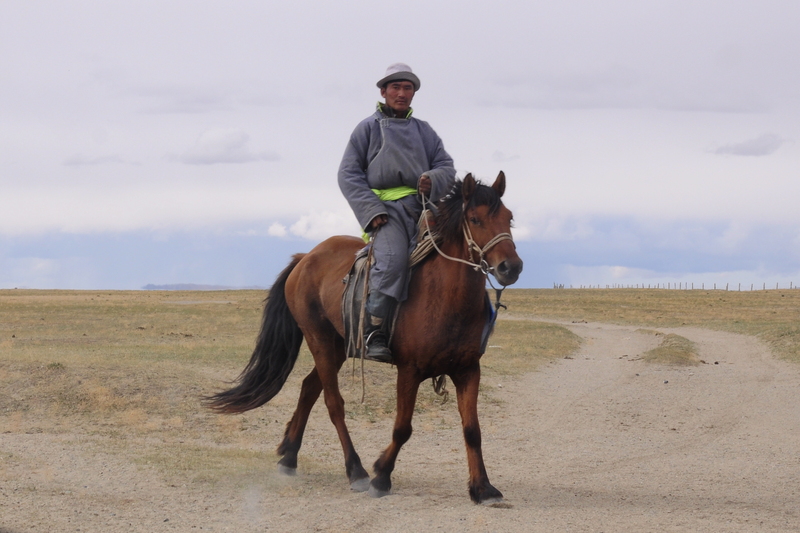 He offered to take us along, and so we embarked on an epic road trip from the capital all the way to the West, to the city of Ulaangom. 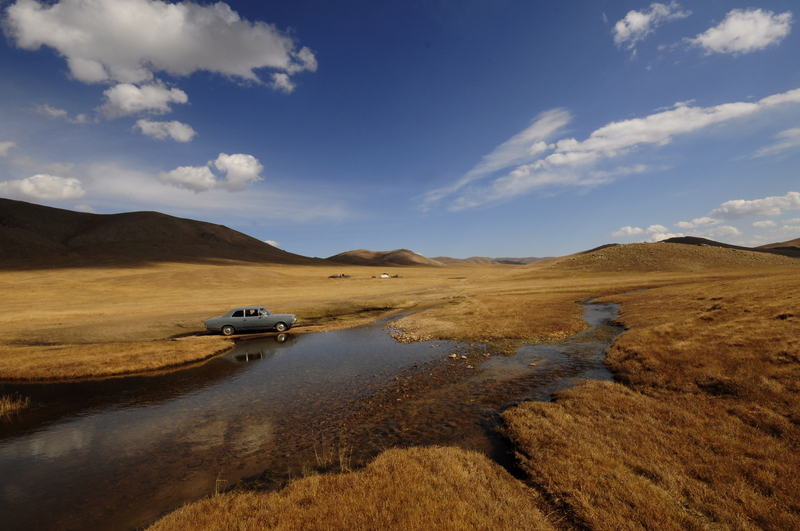 When Tom told people what his plans were, they declared him insane and told him he would never manage to cross Mongolia in his old car. Well, we did succeed, even if- it has to be admitted- the car surely suffered a bit. In summary: we covered about 1000 km of unpaved road- and if I write unpaved, I do not mean the proper gravel roads we sometimes get in the countryside back home, I mean veritable paths, like farm tracks used by tractors, peppered with sharp rocks, bumps, holes, deep tyre imprints, twigs and empty vodka bottles (they are everywhere…). We had to go over very steep mountains (sometimes the car needed a little push), we crossed 12 rivers- no bridges obviously (shallow ones, but yet, we did not drive a Defender, so at times we had to wait for the motor to dry afterwards…), we got grounded on dry mud at one time and stuck in sand another (after much digging, Rekord drove on happily). We were snowed on, rained on, powdered by dust and sand, slept in the car (and September gets pretty cold in Mongolia, around 0 degrees Celsius), and got lost twice in the wide steppes (despite a GPS, which, it cannot be underlined enough, is absolutely essential when driving in this country). And travel was slow. Some days, due to road conditions, we made only as much as 130 km in 9 hours…..But, as we say in German : ‘Der Weg ist das Ziel’. On our way we were fortunate enough to see a lot of this amazingly diverse country. 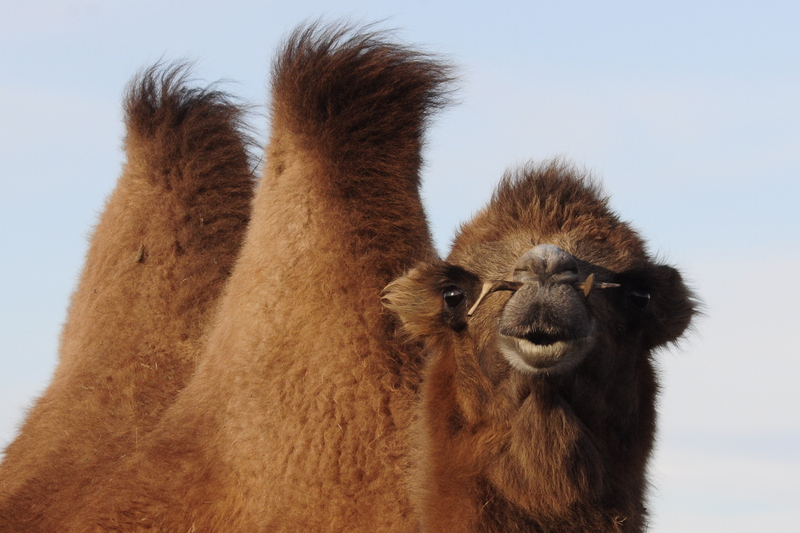 Most people, upon hearing Mongolia, think of steppe and horses, but nature has way more on offer than that. 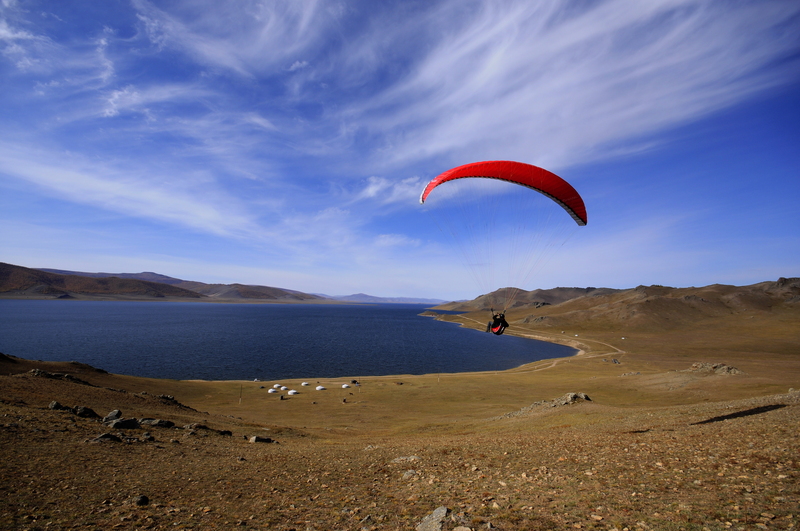 There are huge forests and lakes in the North, mountains up to nearly 4400 m in the West, a central ridge of snowcapped mountains 3000 m and higher, the Gobi desert to the South and another stretch of desert like landscape to the North, complete with sand dunes and camels. Then there are wide grasslands, valleys, streams, gorges…The possibilities for outdoor activities seem endless. We combined nature with culture, and started out by visiting Kharkhorin, a city in Central Mongolia with a famous monastery. After Tsetserleg, once of the provincial capitals, the paved road ends and nature proper takes you in as you bump along through the amazing landscape. 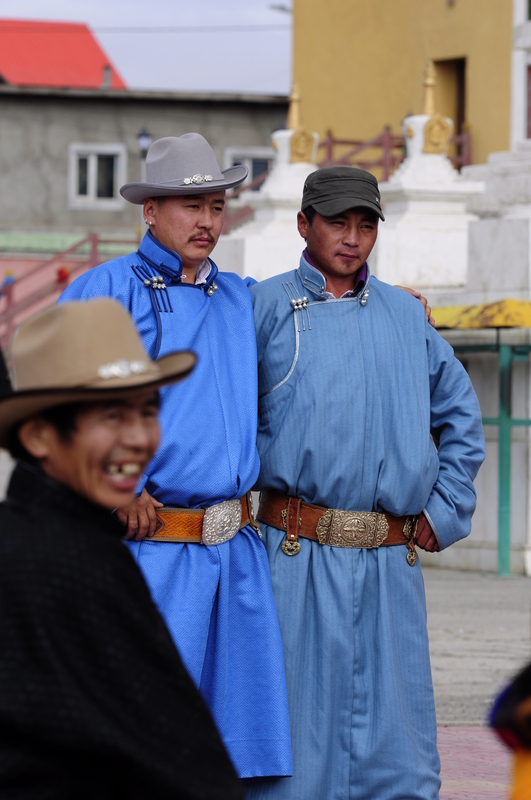 The surrounds are dotted with Ger camps and herds of animals, such as sheep, goats, cows, yak and horses. You see riders minding their animals and families going on about their day to day business, milking cows, preparing for the winter by chopping wood or drying food. We spent a few days at the so called White Lake, slept in a Ger (there are Ger camps for visitors, a bed in a Ger with the additional benefit of an oven so you can make a warming fire at night will cost you around 3 dollars). I went hiking around the lake, Tom tried to paraglide with his own equipment and Nico enjoyed the late September sun. One evening, after nightfall, having done lots of driving in the day and still no town in sight we ended up staying in a family Ger. 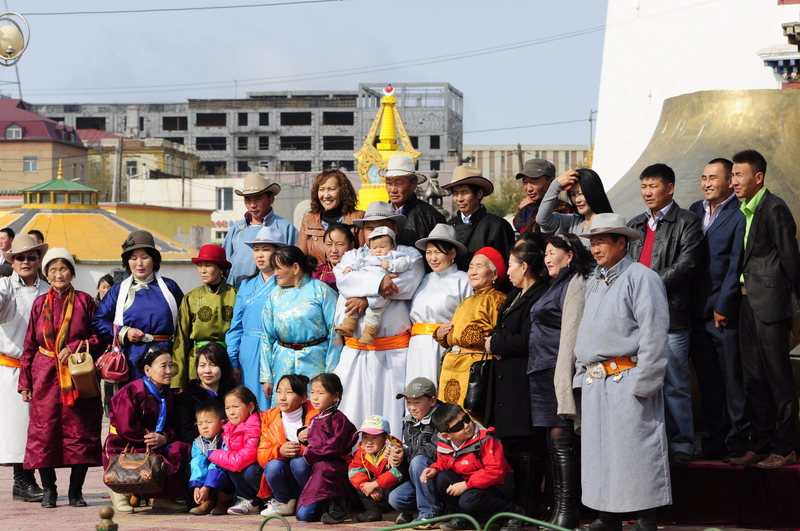 Mongolians are famous for their hospitality. 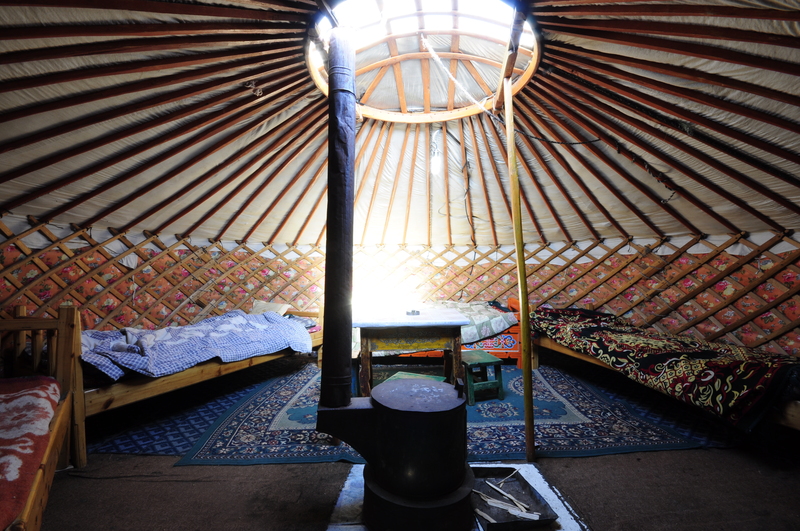 Due to the huge distances in the country, it is common for anyone to offer a bed for the night to a passing stranger, so we could enjoy a sleeping spot next to the fire and some proper Mongolian nomad food, such as fresh sour milk, dried milk curd (it is rock hard…) and a very rich, cream like milk concoction for breakfast. The Mongolian diet is generally strongly based on milk products and meat. Other staples include fried noodles with mutton, or soup with noddles and mutton, as well as mutton dumplings and mutton pancakes. 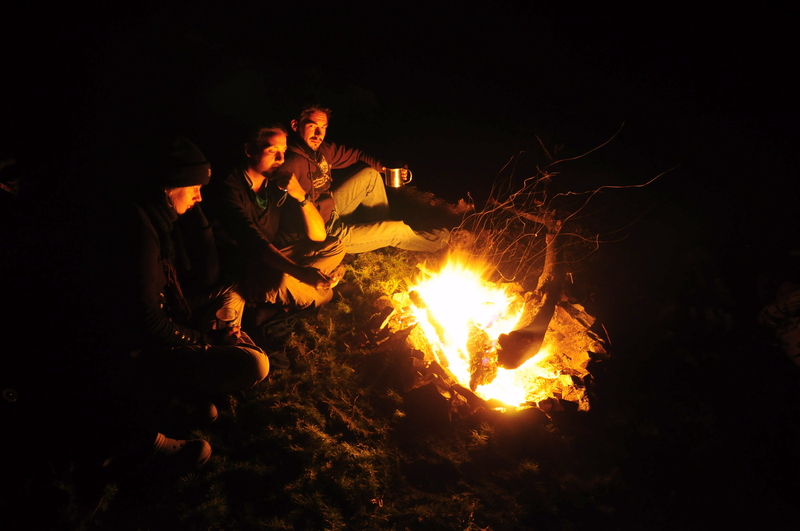 One night we went to the basics good and proper and slept outside next to a campfire, but a sharp drop in temperature made such endeavours impossible in the following days (even some running creeks froze over over night, so it did get pretty cold…). When finally we made it to Ulaangom, dirty but happy (the first shower after so many days was a blessing indeed! ), we parted ways with Tom. He went on to Russia, while we headed further west to Oelgii, a town known for its strong Kazakh influence. Getting there proved a bit of a patience game, as we had to go to another city first, due to unavailability of transport from Ulaangom. It took us two days to travel the theoretically 300 km distance. As an illustration of exactly how patient one sometimes has to be when taking public transport around Asia more generally, day two proved an excellent example. 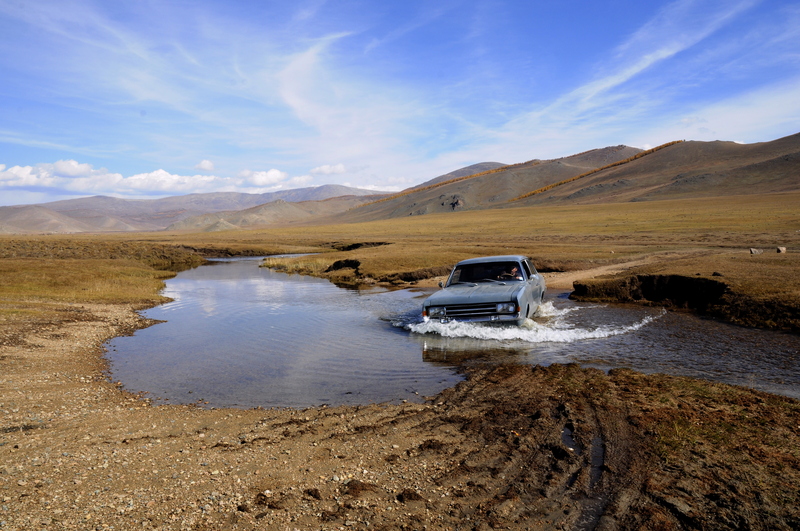 Thus, in the following, as a special feature: Diary of a Jeep trip in Mongolia. 9.30 am: arrival at the Jeep station. “When do you leave?” “At one. Or at 11, maybe. Or at 12. As soon as two more people show up”. We agree to leave our luggage and be back at 11. 11 am: we return. “Come back at 12”. Noon: “You can sit in the car. We will leave now”. We sit down. Nothing happens for 30 minutes. Then, we start driving. 12.40pm: we arrive at an apartment block. Two girls and their luggage are picked up (thus bringing the count up to the 4 people he said were enough for us to leave). Apparently not. They both get squeezed onto the back seat next to us. 12.55 pm: we start driving again. Where to? Back to the starting point, the Jeep station. Lord, give me patience. A lady and a small child get into the front seat. Then another woman into the back, making it 5 adults on a bench for 3. A guy gets into the trunk and sits between all the luggage. 1.10: we start to drive again. This time to the market. All the luggage in the back is unloaded, including our backpacks. Boxes and sacks full of food from the market are put into the vehicle. Then the luggage is put back on top of that. The guy still sits in the trunk. 1.25 pm: we drive. Maybe now, finally, onto the main road out of the city? No. We take a left turn into suburbia and bumpy backroads, until we arrive at a Ger. The lady in the front gets out with the kid, so does the 5th person from our backbench. 1.30 pm: the old lady returns with two huge pieces of luggage. They get tied to the roof. The other woman and the kid stay behind, the old lady gets back into the car. Now we go? 1.40 pm: we drive. To the gas station. The driver collects our money and fills the tank. 1.45 pm: Wohoooooo, we are finally driving!!!!!!!! 1.50 pm: We cross a bridge. There is a car in front of us. It stops. Oh no, we stop, too. Why? No one knows. Our driver gets out of the car. He disappears for 20 minutes, seemingly talking to the guy from the other car. At times, they look like they are arguing, then they laugh again and shake hands. We are confused. 2.10 pm: our driver returns. 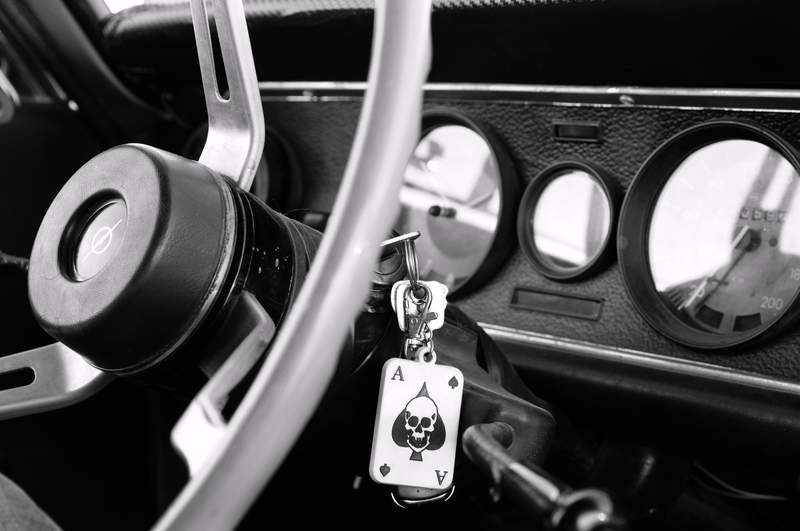 We start to drive again. Finally, the city is behind us. Oelgii, here we come! 2.15 pm: we reach the top of a hill. We stop again. So does the other car from earlier. Driver gets out again. Disappears for another 15 minutes. What do they do???? God only knows. 2.20 pm: Nico serves himself a shot of vodka, I have started swearing audibly. 2.30 pm: unbelievably, but true, we finally go. On to Oelgii, over bumpy roads and through rivers, but no more stops for the next 4,5 hours….Wow. What a trip. So now we are enjoying our last few days in the country, visited a temple complex and the former King’s Winter Palace and hope to find one or the other worthwhile souvenir at Ulaanbaataar’s biggest market tomorrow. All in all, we had a great time in Mongolia and can only recommend the country to anyone who loves nature and is not put off by difficulties getting from A to B!